We bought a few packets of water beads to test out in the Outdoor Classroom sensory bin. They were WONDERFUL! Unfortunately, we didn't buy nearly enough, so our supply was short-lived. 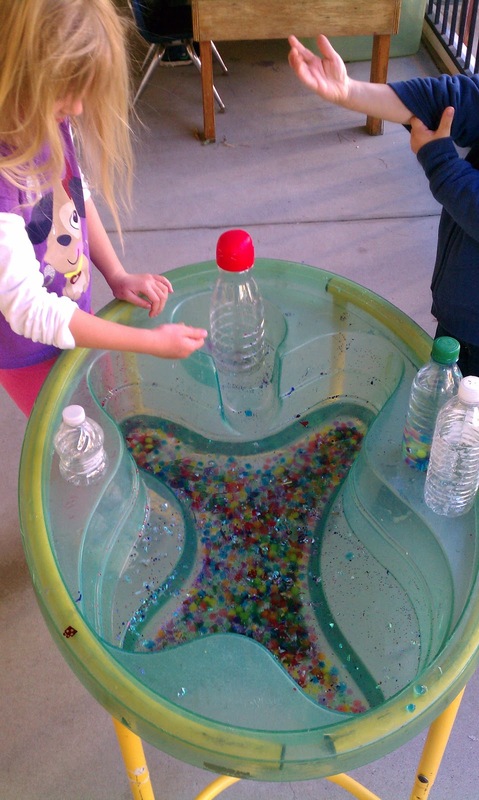 With the remaining few that I had left, I created a Swirly, Sparkly Water Table. 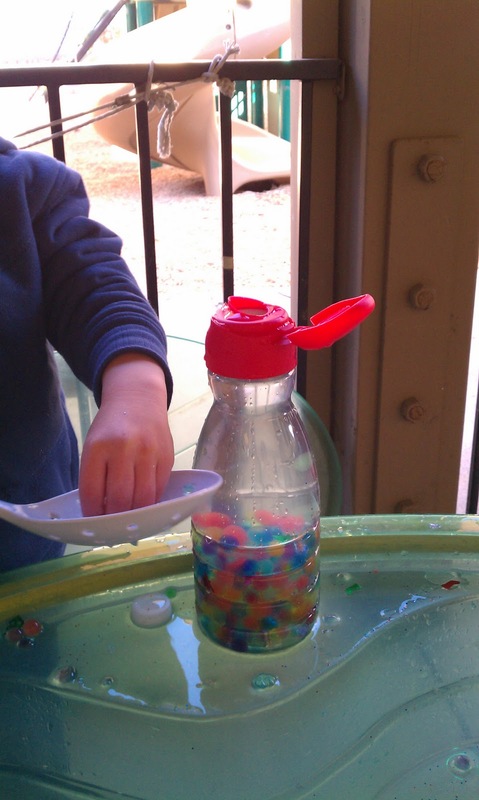 I added water, water beads, Christmas confetti and glitter to a small water table. I also added some empty water bottles. The water was cold, so the children rushed over to our large water table and snatched the large slotted spoons and tongs for picking up the beads. 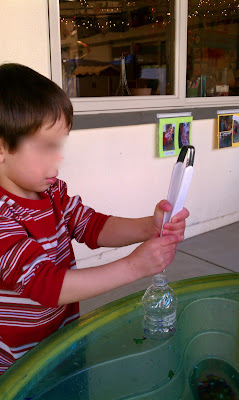 Filling the bottles took a lot of fine motor coordination and patience. The children astounded me with their concentration as they tried hard to fill their bottle with as many beads as possible. Once the bottles were full and caps were tightened, the children discovered that they could swirl the water so it looked like a colorful tornado! 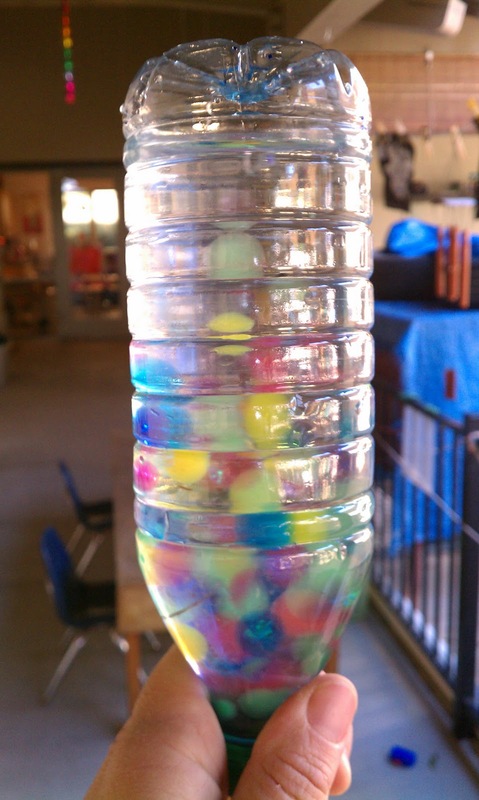 They also realized that when you look at someone through water beads, the other person is upside down! How does that happen, anyway??? Brilliant, I too didn't buy enough but will know for next year huh? We had so much fun with these for over 2 weeks - most unusual. Given their bounciness I may get some more for summer term to enjoy outside. I put some of them on the craft table for the children to glue with & even tho' I knew they would, was still surprised when after a few days they all shrank on the children's work!! Just popping over from "It's Playtime". We love our water beads too! 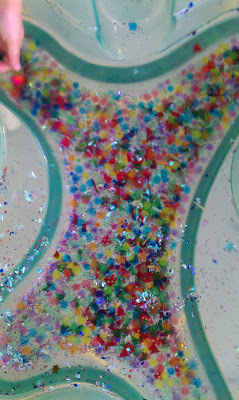 Love the idea of adding glitter! oooh that looks pretty and fun.